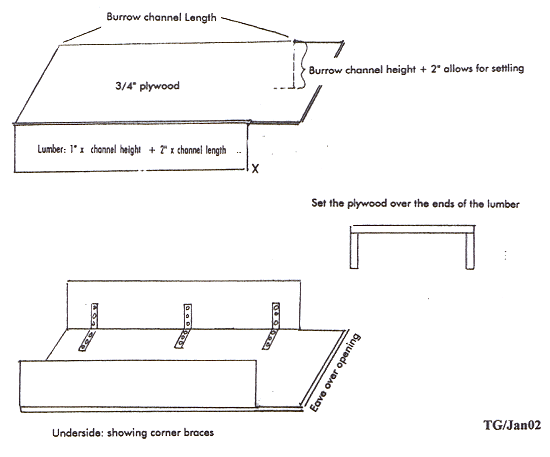 If the soil is too loose to support a plywood roof this design provides both roof and sides for the burrow. Secure the Tortoise Group Booklet Desert Tortoises, Adoption and Care available at local vets in Las Vegas area and on our website. See Table 1. for dimensions for tortoises of different sizes. If made properly–a snug fit for the tortoise– this type of burrow will need to be redone as the tortoise grows. The following is for an adult. Dig the sloping trench 15 to 20 degrees below the horizontal into which the wood structure below will fit snugly. That is about 31/4″ to 41/2″ in depth for every foot in length. “X” on the diagram indicates the corners that should break the surface at ground level. Lumber for the sides should be at least 1″ thick. If you are making the burrow adult size, make the space across the opening of the wood form about 12″ wide. This should allow even a large adult male to turn around inside the burrow. Complete the burrow as directed in the booklet continuing from “Loosening the floor”.